The last 24 hours have been very interesting around our home. 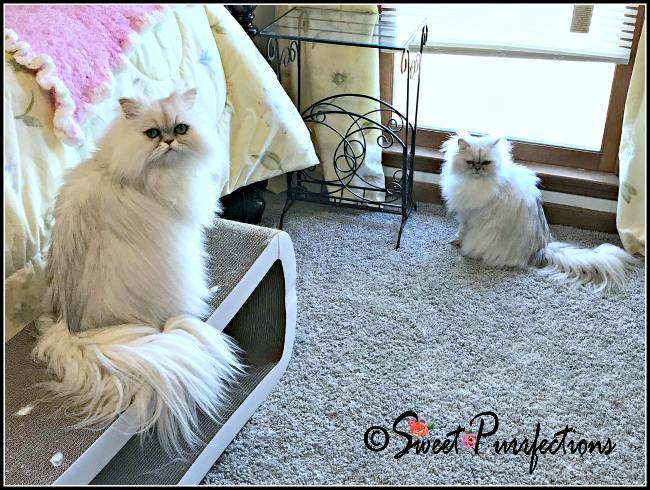 We believe everyone knows we are half sisters and we have the connection of having the same daddy cat, but it turns out, we have a lot more in common. 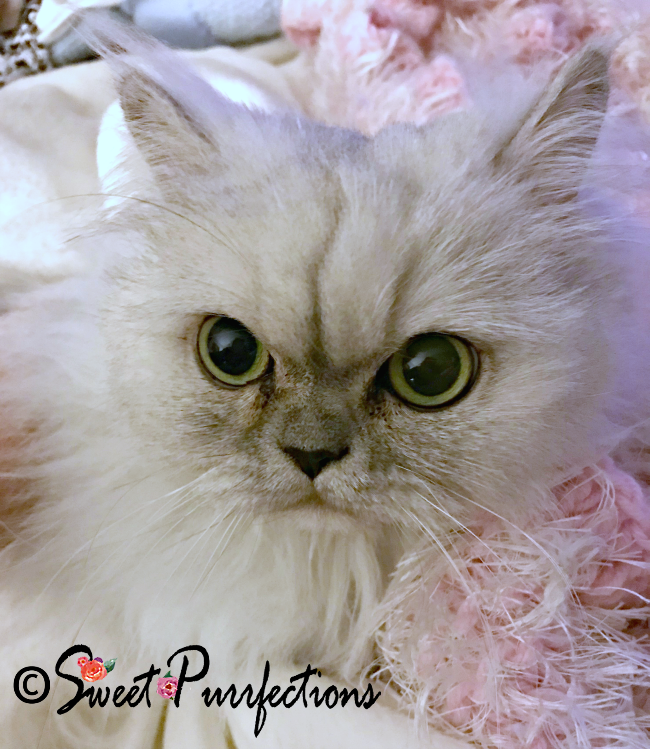 Last Friday, we found out that Truffle needed surgery to remove stones from her bladder. As any good cat mom (or dad) would feel - she was quite stressed - and the girls picked up on her tension. Brulee definitely knew something was different and would basically stay away from Truffle the first two days. Truffle became quite vocal and clingy. By the time Tuesday night rolled around, both Brulee and Truffle were staying near Mom Paula in whichever room she was in, but Truffle insisted on being held or climbing into Mom Paula's lap. Tuesday night, Mom Paula decided to sleep in the chair in hopes that Truffle would stay nearby and not hide under the bed. Truffle climbed into her lap and stayed there until about 4:00 am when Mom Paula went to the bed for a couple of hours. When Mom Paula woke up (like she really ever slept), she saw Brulee sleeping on the blue suitcase, but didn't see Truffle at first. 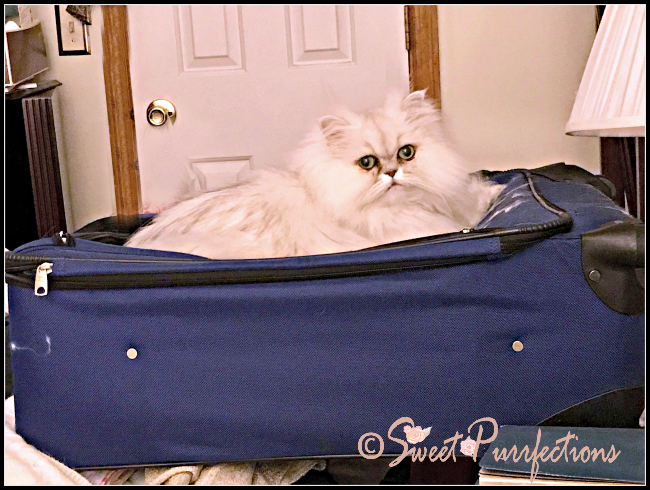 She looked over to the side of the room and Truffle was sleeping on top of the other suitcase and came over to the bed and snuggled in with Mom Paula when she sat up. 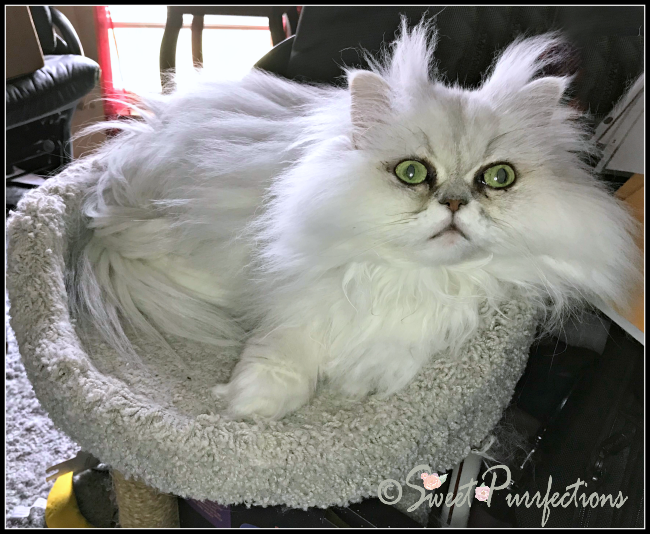 Mom Paula kept Truffle in her arms for several minutes because she knew the time was coming to put her in the Sleepypod® to head to the vet. As Mom Paula began carrying Truffle to the front of the house, Brulee took off to the office to hide again (she's never done this before when going to the vet, except for the last two visits when Truffle was going alone). Mom Paula left about 15 minutes earlier than usual because she didn't know what the traffic would be like, even though our vet is only a few miles away. She forgot it was Spring Break week and there was very little traffic. She parked in front of Cherokee Trail Veterinary Clinic, turned off the car, unzipped the top of the Sleepypod enough to put her hand inside to pet Truffle. They sat there for about 15 minutes until someone opened the door at 7:30 am. Mom Paula held back a few minutes because two people got out of vehicles with dogs and know all were being dropped off for surgery, Mom Paula didn't want to stress Truffle anymore than she was already. Mom Paula held it together pretty well until one of the vet assistants walked up to her and said, "we're going to take care of her and she'll be alright." Mom Paula began crying. They told her she'd be able to pick up Truffle the next day. Mom Paula came back home, put on her pjs again, and got back in the bed. Brulee came into the bedroom and was looking around. She was hunting for Truffle. Mom Paula laid down and Brulee did her little ritual before settling into the crook of Mom Paula's arm and rested her head and one paw on her shoulder and began purring. They stayed in bed for a couple of hours and Mom Paula decided to get on the computer to keep busy. Brulee followed her in the office and jumped onto the top of her small cat tree behind the office chair and stayed there watching Mom Paula. Anytime Mom Paula got up, Brulee followed her, looking around. Brulee wouldn't eat any of her food, but wanted treats. Around 3:10 pm, Brulee became very restless. She began going from one cat tree to the other. She tried to climb on the desk in front of Mom Paula. She meowed to be picked up. She wouldn't settle in like she usually does and wanted down again. She was staring at Mom Paula and meowing. She jumped down and went to the hallway and looked around and meowed. She was very restless and anxious for about 15-20 minutes. Mom Paula went to the front of the house to turn on the TV to take her mind off the fact it was time for Truffle's surgery. Brulee came into the living room and finally agreed to eat a little. She jumped on the back of the chair and settled in, got quiet, and took a nap. She was so quiet the next hour. Mom Paula received a phone call about 4:45 from the vet stating Truffle was out of surgery and was waking up. Dr. Boyette told Mom Paula he removed two stones: a large one and a small one. He said they took additional x-rays and there was no evidence of other stones. He is sending off the stones to determine what type they are. He said Truffle was awake, but still groggy, and she'd stay overnight at the vet and Mom Paula could pick her up sometime Thursday afternoon (our vet likes to watch them for 24 hours after surgery). They discussed other issues concerning the stones and we'll share that later. Mom Paula then asked Dr. Boyette what time he began Truffle's surgery and he said around 3:50. Mom Paula then asked him what time they began prepping her and he said about 20-30 minutes earlier. That was the time frame Brulee became so restless and vocal and the time of the surgery was when she became quiet. This information caused Mom Paula to realize how connected Truffle and Brulee really are. She knew Brulee understood Truffle wasn't well and wasn't at home, but the fact she became stressed at the exact same time Truffle was stressed because of the prep for surgery proved they also communicate telepathically. The vet said Truffle was on pain meds and would sleep most of the next 24 hours - Brulee has been calm since then! Even though they aren't littermates, they definitely have that connection. Around 7:00 pm, Mom Paula received a text message with a photo of Truffle and the message "Hi Mom, I'm doing great after surgery. See you tomorrow.” We think Truffle looked great for just a couple hours after surgery and Mom Paula was a little jealous they were able to get such a clear photo of Truffle! Thank you for all of your purrs, prayers, and good thoughts. You'll never know how much your friendship and caring means to us. Yyaaay Truffle will be home soon. Oh girls you had us ALL worried there. Truffle and Brulee certainly DO have a bond, and I bet Coryelle would have a heap of stuff to say about that wouldn't she? We can't wait to see you home again and all THREE of you relaxed and happy again. Coryelle has already shared some thoughts with us! What a relief to hear that Truffle came through her surgery. Of course there is a connection between her and Brulee... we cats are more in tune than humans are, and even more so with cats who live with each other... even MORE so when they are also related! I am so sorry I have not been around to follow this. My Internet company messed up, and I've been with limited access through my phone all week. What an amazing connection the two girls have. So glad everything went well! Hopefully that's the last you'll see of stones! That is such a wonderful connection the girls have and we're so glad the surgery is over and Truffle will be home soon. Thanks for joining the Thankful Thursday Blog Hop! I'm so glad things went well! It is really special that your girls have that connection. Our Shelties are funny about vet visits. They don't like being separated. We end up taking both of them most of the time as they really do stress out when separated. When Bailey was getting diagnosed, Katy was a terror to be around while he was in the hospital. 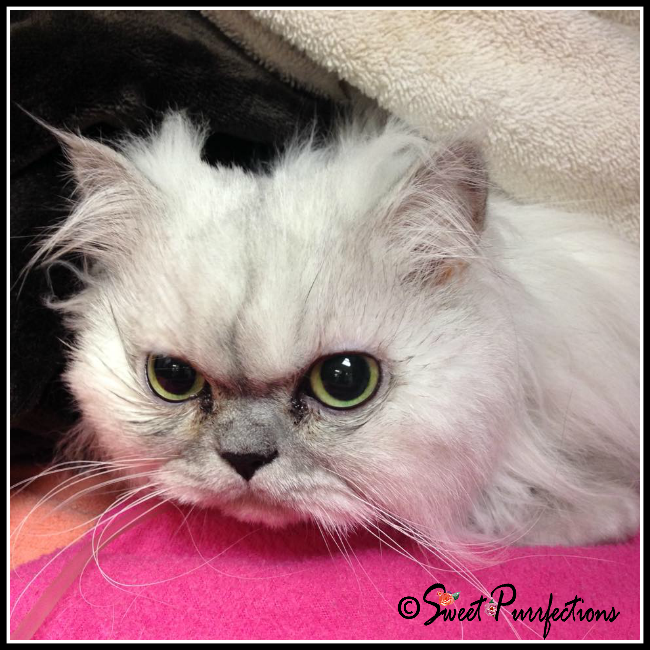 We're glad everything went well for Truffle and we purr that she has a speedy recovery and no more problems. How interesting that Brulee picked up on all of that. Cats are very intuitive. Woo hoo for Truffle coming through with flying colors. I am glad Truffle is doing well. That connection of these two is amazing. We're so happy that Truffle's surgery is over and that she's okay. We know you will ALL be happy to have her home. The feline connection truly is incredible. I've had my share of stories as well. I am so glad Truffle is doing okay. Bless her sweet little heart! Purrs from Deb and the Zee/Zoey gang. More healing purrs and we are glad that Truffle is doing OK. I hope there are no more issues with those pesky stones. I'm glad everything turned out well. What a great thankful post. What a sweet connection. My babes have a connection but theirs is formed from their love of each other. Glad all is well with the babe. So glad Truffle git through everything and is doing well. The connection doesn't surprise me, though ! I love the little girls and fond of you. I am so grateful this is over for you three. I don;t doubt a bit that the girls are linked. We cats are very intuitive and we totally understand how Brulee and Truffle are connected so closely. Thanks for sharing this wonderful story. And we're glad Truffle is doing well! Cats have so many more abilities than we give them credit for. We hope Truffle is continuing to heal and doing well. I am glad that Truffle's surgery was successful and she is recovering well. Cats are aware of much more than we will ever know. I'm so happy to hear Truffle is doing well, it really is so traumatic when our pets are separated from us. Sounds like she was in great hands, I mean I've never heard of getting a text from the pet letting their humans know they're fine. Nice touch!! As I was reading about Brulee's restlessness I somehow thought she must have been sensing when Truffle was getting ready for surgery. The connection truly is amazing. How can anyone believe animals aren't sentient beings! Awe, how sweet. Brulee was clearly worried about Truffle and sensed something was going on. I am so glad Truffle's surgery went well and that you are all three back together. I was so happy to hear Truffle did well in surgery and would be home soon. Yes! They really are more than half sisters, they behave like twins. What one feels the other does too. I;m sure Brulee could also feel mamas anxiety too. I’m so relieved that Truffle’s surgery went smoothly and Brûlée made it through their separation. They clearly have a close bond. Just going to throw out there that the vet’s focused picture could be helped by Truffle being on pain meds, so don’t beat yourself up. Your photos always capture their beautiful spirits! Isn't that interesting that they are connected like that. So glad Truffle did well (it is a great recovery photo but I love your beautiful photos too as you know) and the painful stones are gone- what a relief. Hope you are enjoying your weekend relaxing with both the girls Mom Paula. I was so relieved to see on Facebook that Truffle's surgery went well and that she was doing alright. I know how hard it is when you have to leave your furbaby in the hands of someone else when they are not well. It's so scary. I can't believe Truffle and Brulee have such a connection, that is so weird! I'm so glad that Truffle's surgery went well! I hadn't really thought about it from Brulee's perspective, they must have an incredible bond. Wow, what an incredible connection those two have. It must have been shocking to see how perfectly the times matched up! I am so glad Truffle is doing well and all of you can relax. I am so glad that the surgery went well! That is so interesting that they have such a strong connection! I know if my one of my dogs had to stay overnight at the vet, the other two, especially Echo, would be worried. Wow, what an incredible experience! I’m so thankful Truffle made it through surgery and is on her way to recovery. You are such an amazing pet momma! Not only because you pay such close attention to your cat’s behavior, but also that you had the sense to ask about the timing of everything in connection to Brûlée’s behavior that day. I’m not sure I would have thought to ask, but how fascinating your discovery of the girls’s intimate connection with one another!